In the early 1990s I was a short-term consultant at the World Bank looking at about eighty projects in different parts of the world to see what use was made of community participation and modern communications technology. 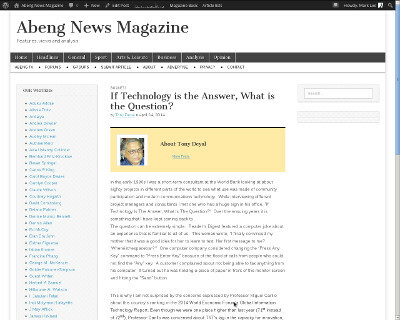 While interviewing different project managers and consultants I met one who had a huge sign in his office, “If Technology Is The Answer, What Is The Question?” Over the ensuing years it is something that I have kept coming back to. The question can be extremely simple. Reader’s Digest featured a computer joke about an experience that is familiar to all of us. This woman wrote, “I finally convinced my mother that it was a good idea for her to learn to text. Her first message to me? ‘Whereisthespacebar?’” One computer company considered changing the “Press Any Key” command to “Press Enter Key” because of the flood of calls from people who could not find the “Any” key. A customer complained about not being able to fax anything from his computer. It turned out he was holding a piece of paper in front of the monitor screen and hitting the “Send” button. This is why I am not surprised by the concerns expressed by Professor Miguel Carillo about this country’s ranking in the 2014 World Economic Forum’s Global Information Technology Report. Even though we were one place higher than last year (71st instead of 72nd), Professor Carillo was concerned about TNT’s lag in the capacity for innovation, the low level of sophistication in technology innovation and that despite having the technology infrastructure in place we do not maximise its use. We are high on readiness but low on usage and creative applications. I once worked at a local company as a manager. Since I learnt to touch-type as part of my professional training (proficiency in typing was mandatory for entry into the second year of a four-year journalism programme) I never needed a typist. Personal computers were not yet around and mainframe usage was only for accountants and engineers. So there I was banging away at a Smith-Corona in my office, with the door wide open. One of the other managers walked in and was shocked. “That is infra dig,” he said disapprovingly. I thought he was joking but he was absolutely serious. A few years later every manager was given a PC and trained on its use but I continued to be the only one who used mine. The others had their secretaries open and print out their emails and then dictated their responses for their secretaries to type and send. One theory of innovation is that the greater the diversity of any environment the more likely it is to be innovative. Trinidad and Tobago is one of the most diverse places on earth with tremendous differences in race, region, class, religion and points of view. The creativiy is on display at Carnival although whether there has been any innovation since Peter Minshall’s Tantana is questionable. Yet, as Professor Carillo says, “Really and truly innovation works whenever you have a base of consumers that demand innovation and, to be quite honest, we are not really that demanding in terms of our products and services offering. There is a knowing and using gap that has to be fixed.” He is of-course touting a Master’s Course in Information Systems and Technology Management at his Lok Jack Institute. Me, I would suggest some basic education like pointing out that the space bar is not the place where astronauts hang out.